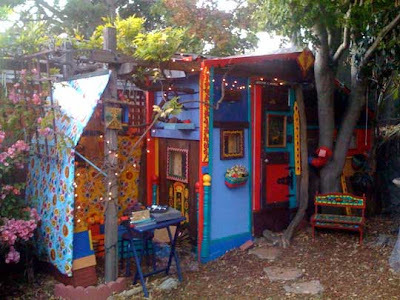 Funky n' Klunky- an artists shed? 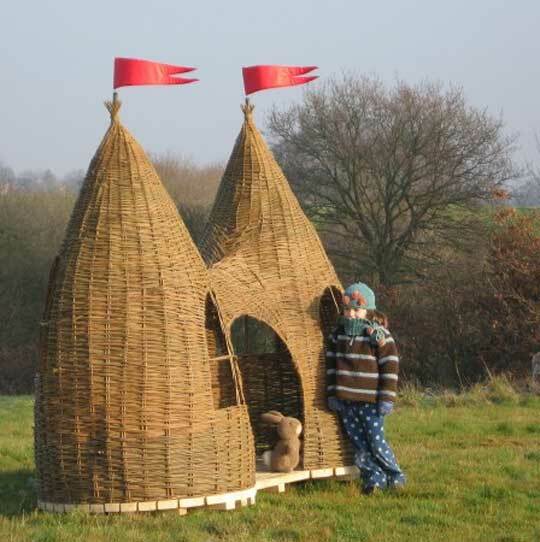 fort? hippie hut? The colors maaannn....the colors..... 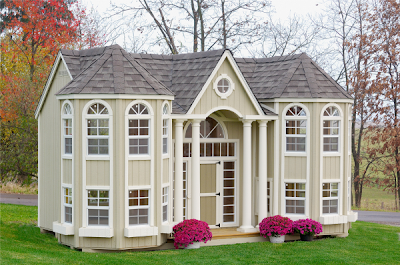 Check out this unique shed, fort, or kids cabin- I'm not sure exactly what it is, or who it was built for, but it sure is a head turner! 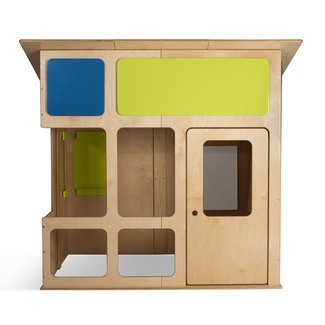 Its got "Ikea" written all over, but its actually made by the company "PB Kids"
As I was a bookworm myself, as a kid- well, still am- I would have LOVED this little hut/reading playhouse! 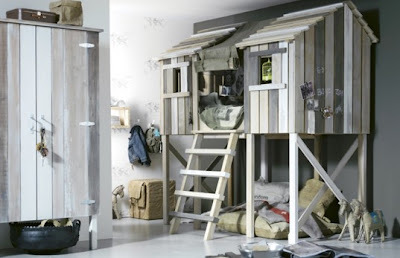 Its appears as if inside is ample space for a bed/sleeping, but its hard to really make out the interior in the photos. I might be a little afraid of my kid climbing up and over the rope rails and really messing himself up, but WOW, for an eye candy shot alone, what a cool fort. Is the bed inside? I wish I could see more. 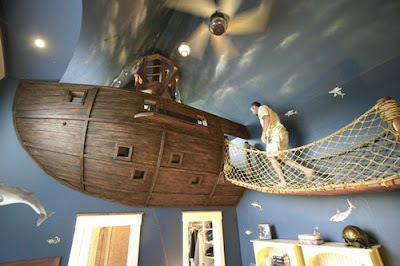 Part ship, part treehouse, part tiny wooden cabin- ALL incredible playhouse- I'll take it! 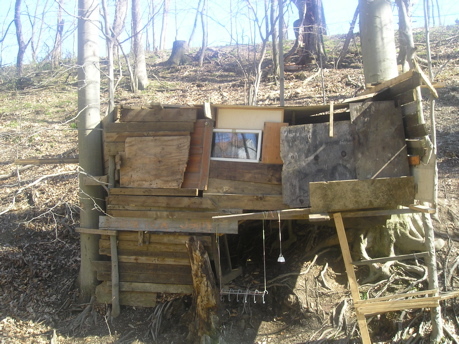 Now THIS is the kind of fort I love stumbling across- hokey, fun, sloppy, and clearly made by a kid. 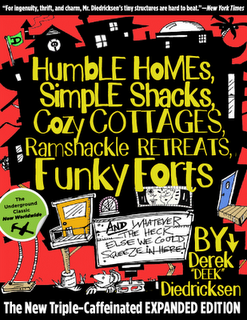 I wish all the fort books out there had more of this line of shacks in 'em- MUCH more "Real" than all the father-built or designer playhouses, treehouses, and clubhouses out there. 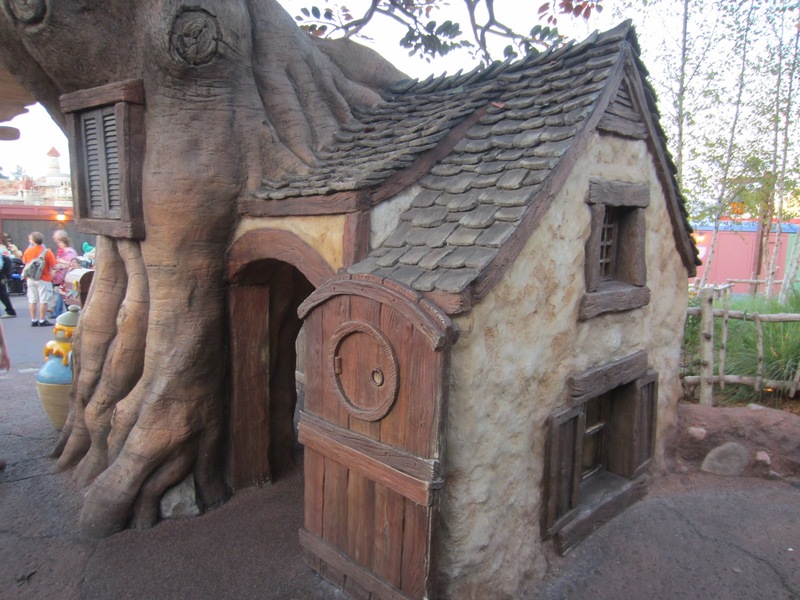 Disney World in Florida is a GREAT place for micro architecture viewing, and kids fort/shack ideas- check out this one, where kids can romp/play while waiting in line for the "Winnie The Pooh" ride (formerly the building that housed "Mr. Toad's Wild Ride"). I've been seeing more and more of these hobbit-style houses and playhouses as of recent, but thought that this one looked particularly fun. Its kind of a J.R.R. Tolkein-meets-Timothy Leary thing going on here. It also appears as if its a simple plywood-shelled structure, topped with a tongue and groove roof- 'couldn't be any simpler, and the result, with the cool paint job, its just so much fun. He-Man's Castle Greyskull- in Snow Form??? 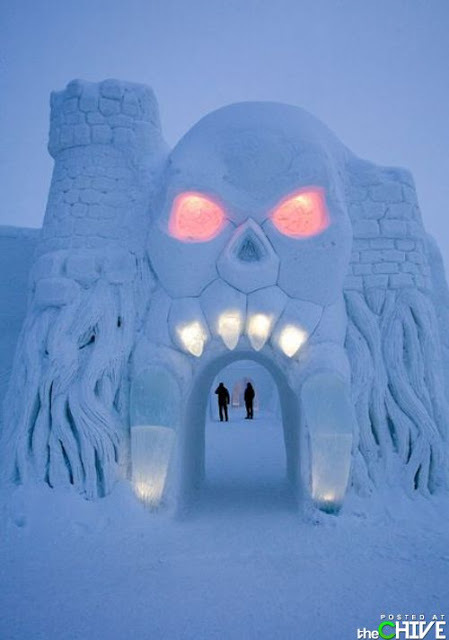 Check out THIS Snow Fort! 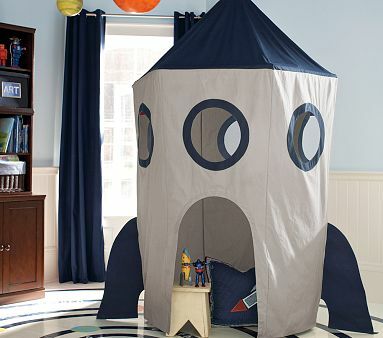 Obviously not a long-lasting fort/kids playspot (and one that might give 'em nightmares! ), but wow- talk about an impressive snow fort/castle! Kind of a He-Man Castle Greyskull thing going on- if you ever saw that cartoon. 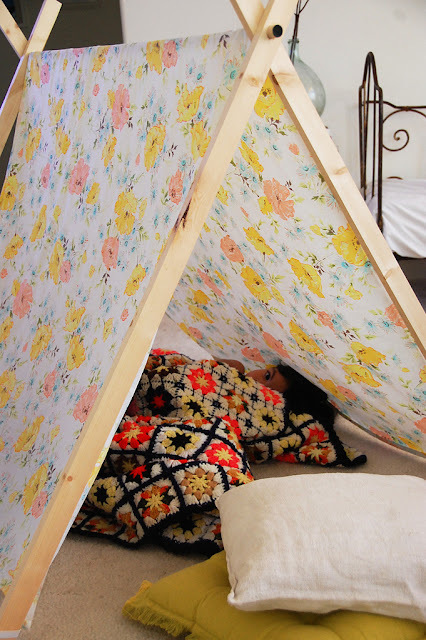 A Folding Blanket Fort/Kids Tent- SO SIMPLE! It could also work as an outdoor (good weather) playhouse for camping or picnics. A seasonal fort or play tent for children. 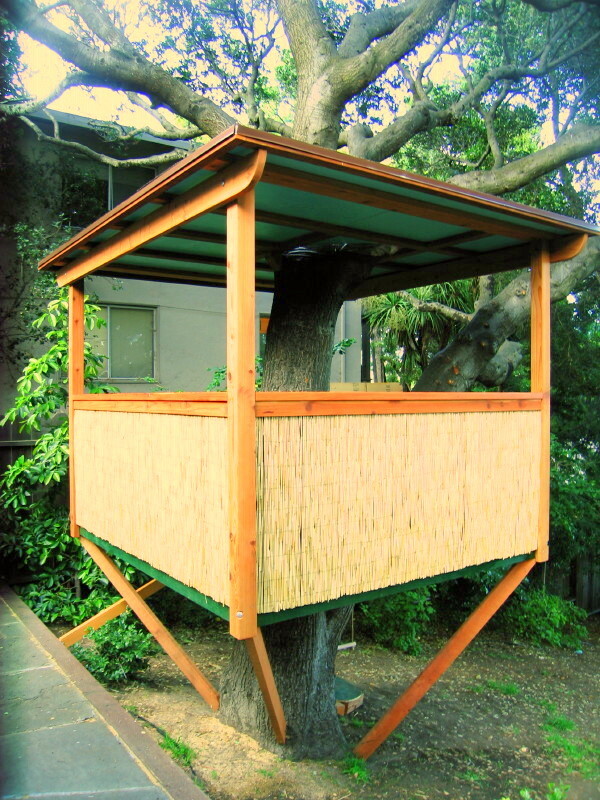 This treefort/treehut is about a simple as it gets. When the kids outgrow it, move in the deck furniture (if you haven't already) and drag in the grill, and its your own outdoor, entertainment, oasis (for a limited size crowd, naturally). 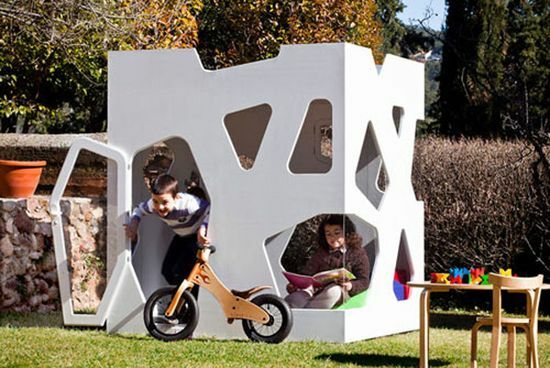 A truly green (and literally ONCE green) take on kid cabins and play spots...(and it'd be fun to make one of these with your kids- a great learning experience too). 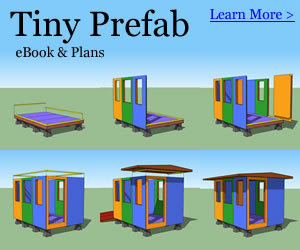 PerfectPlayhouses.com is the maker/designer and they have some pretty wild, fun, and eclectic stuff in their catalog- check 'em out...Victorian Playhouses, Tiny Cape Cod Cottages (I like these the best), Indoor Clubhouses, and Gingerbread Cabins/Small Homes (also pretty gorgeous) are among the styles they provide- they ship 'em as kits too! 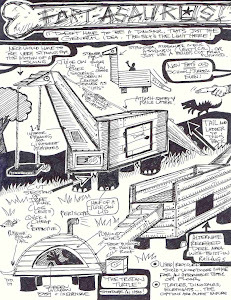 I actually posted a photo or two of this one on Relaxshacks.com a long ways back, but while going through my collections of fort. 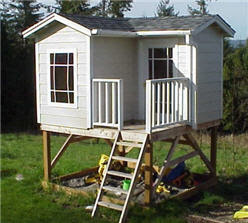 cabin, and tiny house/playhouse photos I came across it again and just had to toss it up here. I love the simplicity of it- box-framed 2x4 work, the blackboard-paint wall, and I'm a total sucker for the color orange, which gives this place such a fun look. The cool, modern, Ikea ceiling lamp doesn't hurt either. 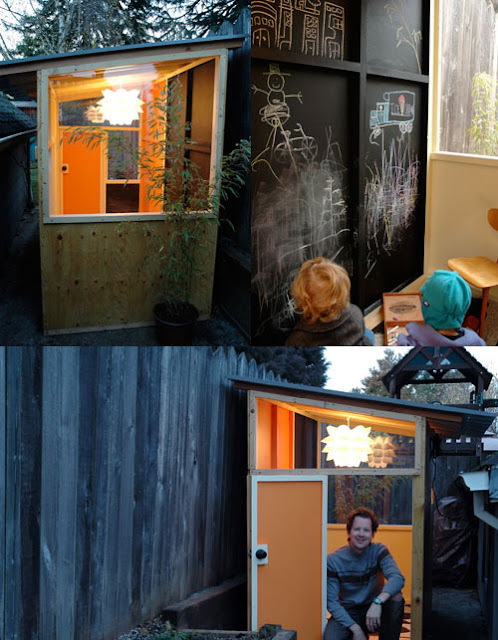 Very nice work Joel, your kids must be thrilled! Joel also runs the STELLAR (I didn't know of it until now, but I'll be back! )- MADEBYJOEL.com and just released a really cool looking book (below) titled "Made For Play". He was also recently featured (Congrats!) on the Martha Stewart Show- well deserved too. 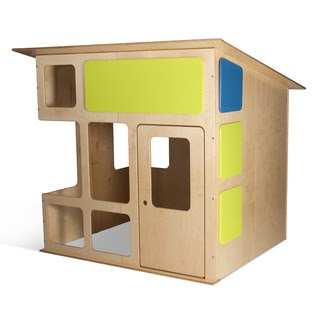 I came across this little modernistic playhouse/fort today, and wasn't a bit surprised when I found out its designer was Edgar Blazona- who seems to have a signature style of sorts. I blogged on his MD100 guest house on my other blog www.relaxshacks.com not that long ago. The man does some very interesting/unique/great work and I love the colors he employs in most of his works- very vibrant, fun, playful. 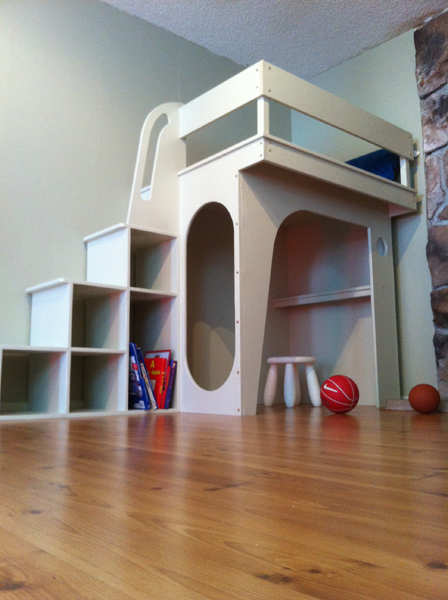 This 277 pound playhouse lists at around $1200.00- and you can find more info HERE. 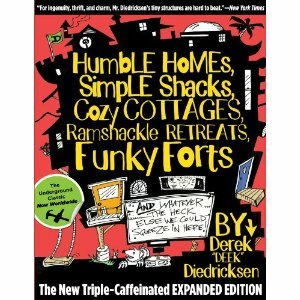 I've got a few of these type ideas in my book "Humble Homes, Simple Shacks"- (ie. "The Bort" (bed-fort)- so check that out if you'd be so kind- MADE/PRINTED in THE USA too! 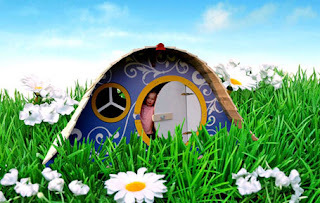 CLICK HERE TO CHECK IT OUT/THE REVIEWS etc. 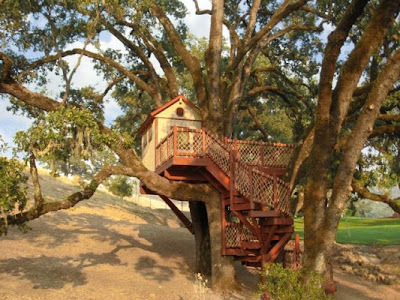 Heck, just exponentially increase this one's measurements, and I'd LOVE something like this as an adult vacation cabin/cabin/tiny house. So simple, so cool.... As its on stilts, it'd be a good fit for "unfit" land- a swamp, marsh, hillside- you know, the land that still is ALMOST affordable... I love the choice of windows too! 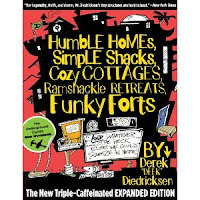 Check out the blog author's TINY HOUSE, FORT, SHACK, and MINI CABIN Book "Humble Homes, Simle Shacks" by CLICKING HERE! Love this one- space saving loft/bunk, that makes use of tansu-style storage steps to get up top. 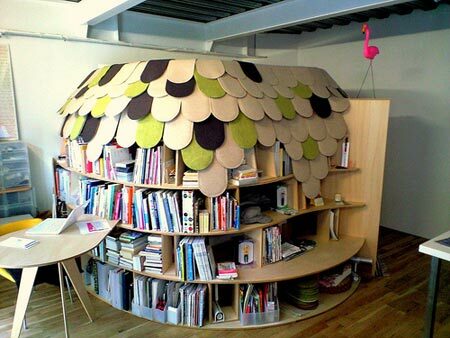 So simple, but with the curved plywood cuts, it looks great. 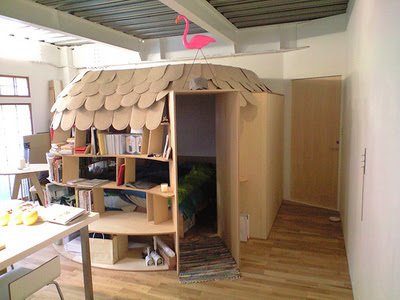 Perhaps a decent idea for your small house, as you could tuck an office or play/reading area underneath quite easily.